High efficiency AeroStrand™ conductors are ideal for AC power use, offering lower resistance and better heat dissipation than traditional stranded or round wire; current-carrying capacity is superior to other cables of equal gauge. 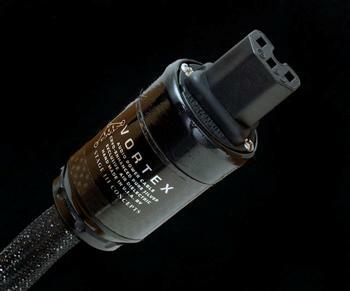 Vortex Power cords have been designed for use with audio or video equipment having moderate power requirements such as: preamps, processors, disc players and transports, as well as low-powered tube and solid state amplifiers. Audio benefits include: reduced noise and improved low frequency performance. Superior resolution with a more defined and open soundstage. Greatly enhanced video clarity and detail thanks to its outstanding noise rejection. Vortex cables are very flexible and easy to install. Schuko & UK plugs optional. Vortex Power cords use 8 AeroStrand™ pure silver conductors (2.00 x 0.60mm) in a noise rejecting dual twin-helix configuration. Air dielectric. PTFE Teflon® tubes with 0.5mm wall. Both polarities (positive + negative) and ground wires are individually shielded with our exclusive, three level TriSilencer™ technology. Oversized silver plated ground wire. Exclusive, polymer-filled, carbon fiber plug housings help eliminate external vibrations. Plugs are Cryo-treated Furutech FI-11(Cu) connectors with pure copper contacts. Available with Furutech SCHUKO or U.K. AC plugs. Very flexible for easy installation.